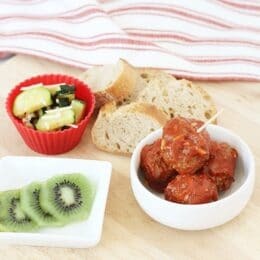 Porcupine meatballs was a childhood favorite of mine! This healthier version is now my kids favorite! If you grew up in the 80’s, you might remember how popular Rice-A-Roni was. Rice-A-Roni is a boxed dinner that included rice, pilaf pasta, and some seasonings, that you cooked on the stove top and was ready in about 20 minutes. By adding things like veggies or meat to it, Rice-A-Roni became a complete dinner. The back of the box had all sorts of add-in ideas and recipes that my mom would try. I remember the Porcupine meatballs the most! 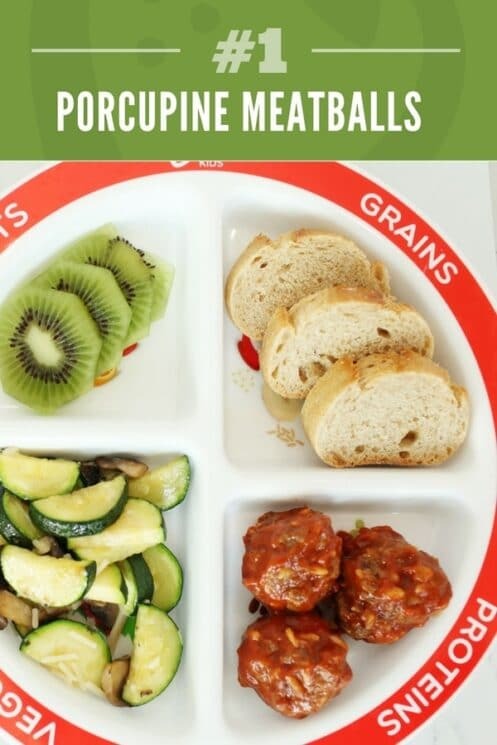 To make the porcupine meatballs, you would combine the uncooked rice with ground beef. Roll the meat into meatballs, and proceed to cook until both the meat and the rice were cooked all the way through. The rice inside the meatball would expand as it cooked, and look like little porcupine quills. Making the meatballs this way is fine, but the seasonings from the packaged Rice-A-Roni is often high in sodium and other unnecessary preservatives. 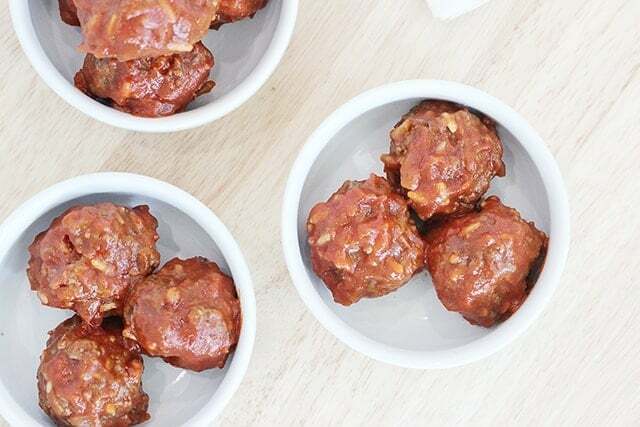 So, when I became the mom, and still wanted my kids to enjoy this childhood favorite dinner idea, I decided to leave out the packaged mix, and use instant rice for our meatballs. I’ve never looked back! Meat- We used ground beef in this recipe, but you could easily use ground turkey instead. A grain- Some meatballs are made with bread crumbs or rice. The grain not only extends the meat, but also slightly binds it to stick together. Seasonings – After the meat and a grain, adding veggies and seasonings will give it the flavor you need naturally. We usually use chopped onion, but you can also include garlic and other herbs and spices. Make meatballs – for kids I like to grab the meat mixture, and roll balls of meat into about 1 – 1 1/2-inch balls. This is a good size to cook through with a short amount of cooking time, as well as be an edible size for kids. Finally cook the meatballs- We use the skillet to cook these, simmering in some liquid to cook the rice. If you prefer cooking meatballs in the oven (without liquid), you would start with pre-cooked rice or bread crumbs. But pan frying in a skillet is a great way to get a nice browned, crispy coating around the outside of the meatball, before it’s cooked all the way through. 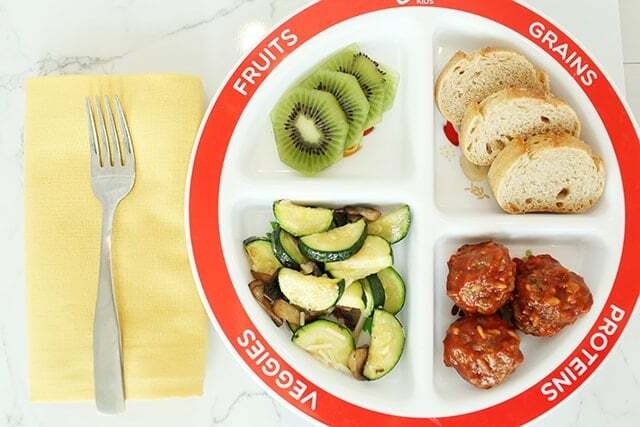 Click here for this choose myplate portion plate for kids! Dice onion and mix with beef, uncooked rice, salt and pepper. Shape into meatballs. In a large pan blend soup, water, and tomato sauce. Heat until mixture begins to simmer. Add meatballs. Bring to a boil, reduce heat and continue to simmer 30-40 minutes. Stir often. Spray a separate skillet with cooking spray and heat over medium. Slice zucchini and mushrooms. Add to the skillet and saute until tender, about 7-8 minutes. Season with salt and top with Parmesan cheese. I’d like to try out this recipe, but is there any substitution for canned tomato soup? I’m not a fan of processed soups, as even lower sodium ones tend to have a large amount. Definitely! You could just use blended tomatoes! I do it all the time. What do you mean instant rice? Is that just normal rice? We live in Australia – not sure if instant rice is something different in America. Hi Kerry! Instant rice has been par-cooked and dried so that it cooks up really fast. If you can’t find instant rice where you live, you can try regular rice that’s mostly- or fully-cooked.